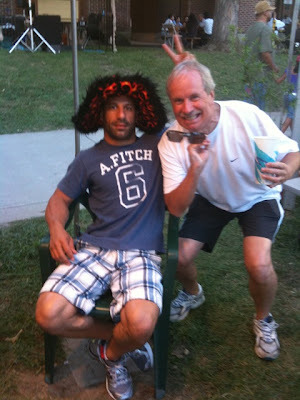 Tony Kanaan has no shame. He also is "fashion challenged". speaking of his lack of shame, he tweeted that he's doing the moonwalk and a samba dance in his latest Apex Brasil commercial. TiKi Torch Kanaan has no shame...and the world is better for it. I don't know what it says... but for some reason I'm starting to feel a little peckish. Man, I could go for some deep fried cotton candy right about now! Why didn't I take that job at Chip Ganassi Racing ???? That is what happens when you eat chocolate bacon. You start hallucinating Robin Miller. TK was partying after learning someone else who knows how to set-up a car would be driving for AGR in Sonoma. Is he re-enacting his pitlane fire at Edmonton?